Today was the Tweet Meet. It seems to start as many things have lately, by a simple statement on Twitter, which then proceeds to take on a life of its own. What began as a tweet about Chinese food at turned into a “we should do” lunch with someone who tweeted liking Chinese food, which in turn had more twitterers jumping on the proverbial bandwagon all in the space of an hour, stemming from two relatively innocent comments (although, perhaps Stevie has learned her lesson about taunting others with satisfied lunch tweets). A spirited communal online conversation resulted in an organized lunch of a dozen twitter peeps, fondly entitled the Tweet Meet. From there? Even more fun. 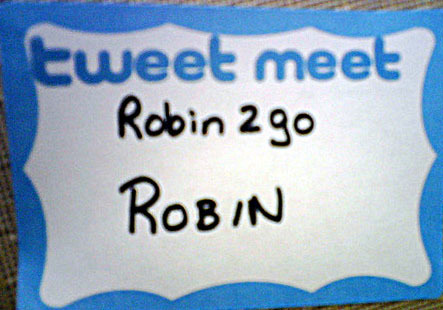 Stevie had made official Tweet Meet name badges with real names and twitter names, and we made initial introductions, where I met two more new people (one of whom I knew others followed, but I didn’t) and a face to face with someone I had first met in Second Life. How did we know each other? Who did we already know? How had we met? What did we do? We had a great time, with discussions of identity and community, and our definition thereof. Having these discussions gave me the opportunity to explore some of the very topics I’d blogged about already–and gave me some food for thought and future postings as well. This makes me giddy with its goodness. Recently, Micala, Reginaldgolding and I participated in Cole and Scott’s CI597 course entitled Disruptive Technologies. Students had been divided into teams and assigned a technology to explore, and ‘Team Tweet” invited us to weigh in on the class discussion about what Twitter was and why we liked it. We had actually added Team Tweet members during the TLT Symposium last month to our Twitter feeds, because they were actively participating in hashtagging the event. Mind you, I don’t know any of them personally, but many of these students continue to add to my Twitter community. Participating in this class discussion (and for many of them, their first introduction to twitter) was a lot of fun as we watched them explore the Twitter Adoption Curve. From my perspective, I suppose I could have been “missing out” by not being there in person; however, it was a very stimulating discussion online, with urls, questions, and discussions being fed to us via Twitter. During that class we had the Dean of Schreyer Honors College ask several questions about what we were doing, as well as some Twitter friends who were getting our discussion via their own Twitter feed. Which really goes to my point of community; you never know where inspiration will come from, or who will add to the discussion. Cole talks about Twitter being “the back channel.” I like that. I like being plugged into something that allow access to more information that can really round out and expand a discussion. In my mind, that back channel takes on the likeness of a spider web, because you become connected to things and people that really surprise you. I have discovered that my professional community has become much more about the greater Penn State community than simply just the community of my own work unit. Cole, Allan, Brad, Jeff, Dean. Stevie, Michelle, Brian, Shannon, Daniel, Tara, Anne, Dana. I work with none of these people. And yet (whether they like it or not) they have become my friends and their lives and their experiences affect me every day. We share gardening tips, and photography, and coffee, and great food. For better or worse, in sickness and in health. In my mind, that’s one helluva community.